Shop dog dental hygiene products at VetDepot.com. Dental disease is the most common health disorder affecting dogs. Most adult pets have some degree of dental disease, and it only worsens over time without appropriate care. To increase the amount of time dogs can go between dental cleanings, owners should brush their pets' teeth daily using a toothpaste made specifically for dogs. If this is not possible, foods, treats, chews, wipes, rinses and drinking water additives designed to improve oral hygiene can help. 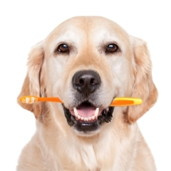 "Dog owners can do a lot to slow the development of dental disease." Every day, plaque is deposited on a dog's teeth. With time, minerals present in saliva convert the soft plaque into hard tartar. Plaque and tartar are very irritating to the gums, causing inflammation which is known as gingivitis. As tartar builds up and gingivitis worsens, the gums start to separate from the underlying teeth. Within the pockets that form more plaque and tartar accumulate, and a vicious cycle has started. 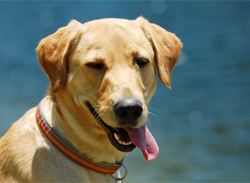 Infection and inflammation break down the connections between the dog's teeth and jaw. Loose teeth that may eventually fall out are the result. Dental disease can also be caused by sudden trauma. Dogs often break teeth while chewing on bones, rocks or fences. If the inner chamber of the tooth called the pulp cavity is exposed, bacteria in the mouth can travel through the tooth and into the bone that surrounds the root producing a periapical abscess. Plaque and tartar is removed from all surfaces of the teeth, including under the gum line, by scraping it away with a hand or ultrasonic scaler. The teeth are then polished so that plaque has a harder time sticking in the future. Fluoride and other preventative treatments may also be included as part of a dental prophylaxis. Loose or severely damaged teeth are usually removed. Root canals and other types of oral surgery are options for saving a tooth in some cases. Dog owners can do a lot to slow the development of dental disease. Daily tooth brushing is best. Soft bristle brushes, fingerbrushes, and even a washcloth can all be effective. Use a gel or toothpaste designed especially for pets. Dogs don't appreciate the minty taste of human products, and the fluoride can cause illness when swallowed. 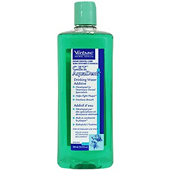 If brushing isn't possible, try an oral rinse, dental wipe or drinking water additive. 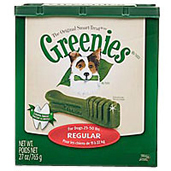 Some types of dog food have been specifically designed to help remove plaque from a dog's teeth. Studies show that regular foods are not as effective as are those that carry the Veterinary Oral Health Council (VOHC) seal. The daily use of dental treats and chews containing mild abrasives, antiseptics, or supplements that break down plaque can also significantly improve a dog's oral health. Even with the best of home care, most dogs still require professional dental cleanings from time to time. See your veterinarian regularly so that any dental problems that do develop can be dealt with before complications arise swiftly.